When U.S. Department of Transportation Secretary Anthony Foxx launched the Smart City challenge in December of 2015, he prompted cities with the task of defining the phrase "Smart City." He wanted to know how cities would reshape their transportation systems if they were given the opportunity, and how they imagine the way people and goods move. He decided a smart city would not only connect technology with innovation, but also technology to the community and its residents. 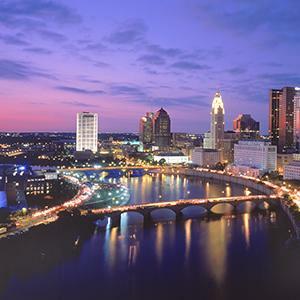 Seventy-eight cities responded to the challenge, seven finalists were chosen, and ultimately, Columbus was selected as winner, beating cities such as San Francisco, Portland, Austin and Denver. "Columbus&apos; proposal puts people first," Foxx said. The city plans to install street-side mobility kiosks, a new bus-rapid transit system, smart lighting to increase safety for pedestrians, improve access to healthcare and install traffic signals that communicate with vehicles so that the signals can adjust in real-time to meet the demands of traffic. As the winner of the challenge, Columbus will receive $40 million from the Department of Transportation and $10 million from Paul G. Allen&apos;s Vulcan Inc. The city has also raised $90 million from other private partners to carry out its plan, including $19 million in public money giving Columbus a total of $140 million to upgrade the transportation network. This means that, soon, driver-less vehicles will roam parts of Columbus, access to electric vehicle charging stations will increase and more cars will be able to communicate with traffic signals and other transportation infrastructure. A key point in the city&apos;s bid was how the money could be used to improve Columbus&apos; infant mortality rate, in that improving transportation in poor neighborhoods could better connect new and expectant mothers to health care services. Also, a transit pass payment system that could be used for multiple forms of transportation could help those who don&apos;t have credit cards or bank accounts, and kiosks could be built to reload transit cards. This will spur economic development and create an enhanced, sustainable transit system. "The bold initiatives they proposed demonstrated that the future of transportation is not just about using technology to make our systems safer and more efficient - it&apos;s about using these advanced tools to make life better for all people, especially those living in underserved communities," Foxx stated. "The commitment by Columbus to explore new ways to use technology to reach beyond the tech savvy and easily accessible is commendable and it underscores the reasons why we started this challenge." For Columbus, being named America&apos;s Smart City will mean access to jobs for all residents, smart multimodal logistics for moving people and freight and a sustainable transportation system that would lead us into the future and make us a model for other mid-size cities. The City of Columbus will collaborate with Austin, Denver, Kansas City, Pittsburgh, Portland and San Francisco to share best practices to help replicate success.